All group packages include admission, paintball marker/mask rental, infinite air and 500 paintballs per person! Walk-on groups are welcome, and will be placed into Open Play. Our Player Pacagke for groups of 1-7 Players is $45/person. See pricing below for larger groups. Looking to play with just your group? Give us a call and make a reservation. Private Parties will have a dedicated referee for a 2 hour block of time. After the 2 hour window, all guests are welcome to join Open Play groups. Groups of 1-7 players requires an additional $20 ref fee, this fee is waived for larger groups. Pricing below. All Private Parties require a deposit equivalent to one individuals package. Private Parties of 1-7 Players deposit is equivalent to one individuals package plus the $20 ref fee; $45 package +$20 ref fee totaling a $65 deposit. Deposits for groups are non-refundable 7 days prior to scheduled event. Groups within the 7-day to 48 -hour window may reschedule to a later date. All deposits within 48 hours of scheduled event are non-refundable and non-transferable. Groups should arrive 30 minutes before their scheduled time for check-in. We work with non-profit parties as well, must present non-profit Tax ID. Put your money where your paint is! What could beat getting your blood pumping for a great cause? 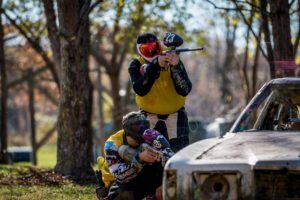 Take your fundraiser to the next level by hosting it at The Paintball Barn. Simply reserve your date, invite your supporters and keep a portion of the proceeds. Call (765) 572-2352 to customize your fundraising event. Bringing your team together has never been easier, or more fun! Paintballing at The Paintball Barn the ideal team outing for any corporate or private group event, putting a fresh spin on team building. 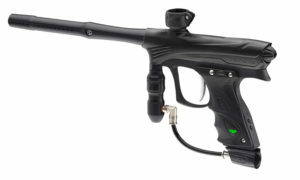 All party packages include admission, paintball marker/mask rental, and infinite air. All party packages require 50% deposit. Deposits are non-refundable 7 days prior to scheduled event. Reservations within the 7-day window may reschedule to a later date. Groups should arrive at least 15 minutes before their scheduled time for check-in. Looking for an exciting, fast-paced alternative to the stereotypical bachelor/bachelorette party? The Paintball Barn is exactly what you’ve been searching for, creating memories that will last a lifetime! big or small, young or old! 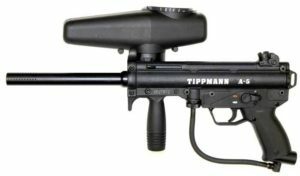 The $10 rental fee includes a Tippmann 98 Custom or FT12 marker, 200 round hopper, 47cu. in. N2 tank (unlimited fills per session), mask, paintball pack, chest protector, and barrel cover. We now throw in chest protectors and pod packs for free! This will give you a little extra protection to make your event more enjoyable, and allow you to carry extra ammo out onto the battlefield. Basic rental equipment not good enough for you? Want to get an edge on your competition? We have your fix.